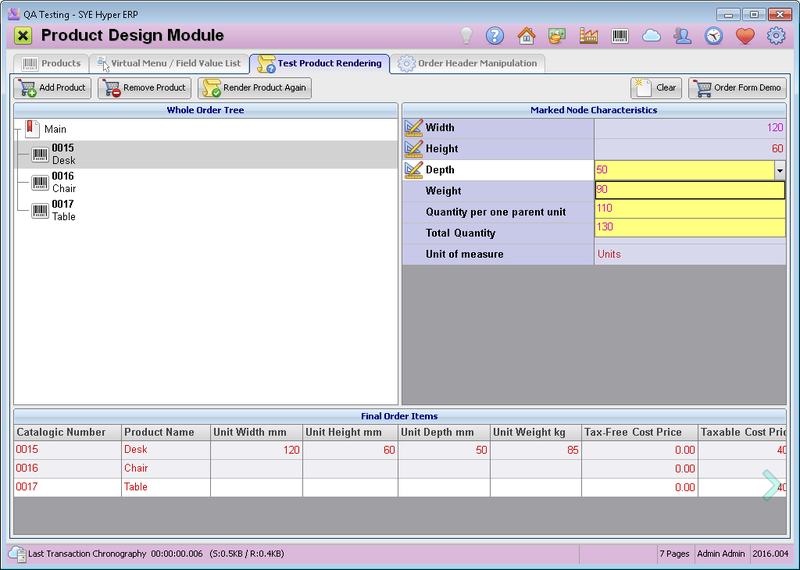 This tool of the "Product Design Module" was designed for creating demo orders, in order to test the orders products definitions, verify and validate the products. This tab displays the products that were selected by the user, and allows the user to test and verify each of the products details. The whole order tree, at the left side of the window, presents the products of the test order. the table at the right side (Marked Node Characteristics) displays the details of the selected product. At the bottom, all of the items and descriptions are presented and include the costs and prices of each item. Additional information fields can be added and displayed according to the users needs and requirements. Use the Add Product button, to select the required items. For item the allows to select and change some of its properties (e.g. measures), select the required values from the properties fields of the properties table. Use the Render Product Again button, to recalculate and render the selected product details, after changing its properties. In order to delete an item from the list, press the Remove Product button, or press the Clear button to remove all of the items from the list. The system allows to create an order form demo, in order to preview the items and their properties in an order form. Press the Order Form Demo button. This button will open a new order / offer form. Please note - this is a demo form (order number = 0) and no order record will be created.